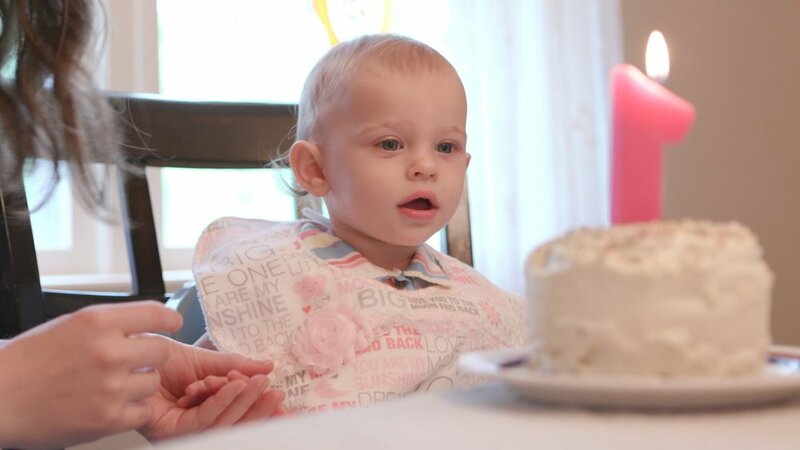 Back in May it was my sweet Ava's first birthday! I spent a lot of time thinking a lot about her birthday cake. I knew that I absolutely wanted to make it myself. But looking through some of my favorite cake recipes, they have SO MUCH SUGAR. My favorite Chocolate Cake recipe calls for 2 cups of sugar, which equals about 4 teaspoons of sugar per cupcake... not including the frosting! I know what you're thinking. Here we go, another dietitian who wants to (literally) take candy away from a baby. But I swear, I'm really not THAT obsessed about having no sweets. No offense to parents that are. Kudos to you if you can successfully keep your kid away from sugar. But my sweet little girl comes from a family who loves their sweets, so it's just not in the cards for us. My philosophy, and hope, is that I can give my daughter enough beautifully, naturally sweet foods, so that when she's old enough to make her own decisions on what to eat, she just doesn't like the super-sweet stuff. There's a huge difference in sweetness between fruit & veggies and foods like cake, candy, and ice cream. I do believe there's a place for all these wonderful treats, but I want to teach my daughter that these things are just that: treats. Once-in-a-while foods, fun foods, and not daily desserts or after-school snacks. So, in anticipation for this epic first birthday cake, I started researching recipes using less sugar, natural sugar, or alternate sources of sugar. I still wanted the cake to be sweet, and taste like a cake, just more naturally sweet. Read on for tales of my sugar-free baking adventure! Some websites advise to just use less sugar (like here and here). Cut down on the amount of sugar in your recipe by 10%, 20%, even up to 50%. No need to replace it with anything. I wasn't sold. Some of my go-to cake recipes call for up to 2 cups of sugar, so cutting that down by 20 or 30% really wasn't going to make much of a difference. I was really hoping to find a very very low sugar or sugar-free recipe. I'll save this technique when baking for the grown-ups. Use a more "natural" sugar? Another popular technique is to replace the refined, white sugar in your recipe with something more "natural", like maple syrup, honey, or agave syrup. You have to be careful with the amount of sweetener you use, because some are more or less sweet than sugar, and since these sweeteners are in a liquid form, you have to adjust the overall liquids in your recipe. Read more here. This wasn't the right approach for me either. While there may be some nutritional benefits to using some of these sweeteners (maple syrup contains some minerals like potassium, calcium, and magnesium), I still see these natural sugars as straight-up super sweet. I was fine to use them to add some extra oomph if needed, just not 100% of the sweetness. Plus, these sweeteners are pretty expensive, and I'm not about to drop $20 to make a batch of cupcakes. Next! You could pretty easily swap sugar for an artificial sweetener, like Splenda or Stevia, in baking. Again, just not the sort of message I was going for, and didn't seem appropriate for a first birthday party. I'm not trying to cut calories, just use a more natural sweetness rather than a super-sweet cake. The search continues! Replace the sugar with a fruit puree? Now this was more up my alley! Instead of sugar, use a sweet pureed fruit, like applesauce or mashed super-ripe bananas. 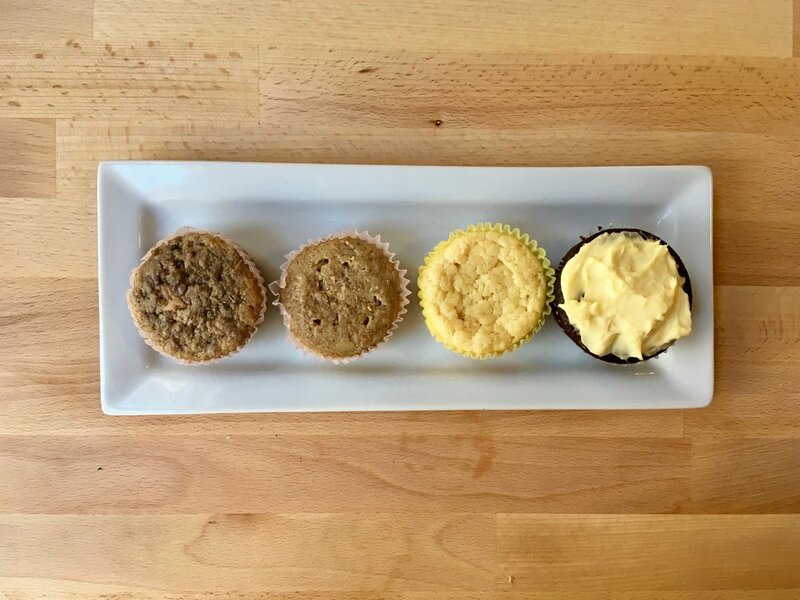 I've seen recipes before for Baby Food Muffins, and I've made a few batches. They came out nice, not too sweet and with a nice fruity touch. I first found this Martha Stewart recipe for Banana Cupcakes. The original recipe uses only 3/4 cup sugar and gets extra sweetness from 4 ripe bananas. To cut down on the sugar even more, I replaced 1/2 cup of sugar with 1/2 cup applesauce, leaving just 1/4 cup sugar in the whole recipe. These came out delicious! Nice and sweet from the bananas, moist, and a lovely banana flavor. But, I felt they were more like a muffin than a cake. And I want her birthday cake to really be a CAKE. 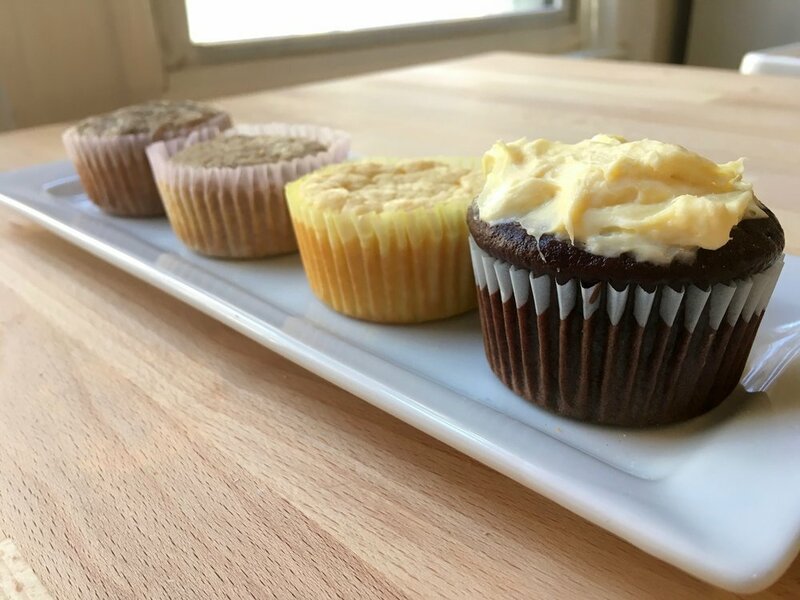 Next, I tried a remix of this recipe for Vanilla Chai Cupcakes. Instead of the 1 cup of sugar in the recipe, I used 1/4 cup sugar and 3/4 cup applesauce. In a word - GROSS! Practically savory, these were headed straight for the trash. The texture was spongy, almost like a baked frittata. No sweetness. Too much moisture, they were just wet. I later realized that I should have reduced the amount of milk in the recipe to compensate for the wet applesauce, but the flavor was so bad it wouldn't have helped much. I knew I definitely needed more sweetness than applesauce could provide. I saw a tip about using frozen fruit juice concentrate, like apple juice or orange juice, as part of the sweetness. Since my daughter's favorite food at the time was oranges, I tried using orange juice concentrate. I used a standard vanilla cupcake recipe, and replaced the 1 cup sugar with 1/4 cup orange juice concentrate and 3/4 cup applesauce. Again, UGHHH! Even worse than my last test. Spongy. Eggy. A little orange flavor, but not enough. Still not sweet enough. I think the winner is pretty obvious! Feeling pretty down about all my failed baking attempts, I decided that I really needed to cut it out with all this applesauce malarkey and use something SWEET. I came across an article about using date paste as an alternate to sugar in baking. Could this be the secret ingredient I was missing? Have you ever tried dates? I absolutely love them. Plain, wrapped in bacon, in oatmeal, delicious! They are sweet, very sweet, but also a little fruity. They are creamy and chewy, and straight up YUM. So I decided to go back to basics, and use my absolute favorite Chocolate Cake recipe, but replace all 2 cups sugar with 2 cups date paste. I really didn't expect to have to make so many test batches of cupcakes! But with baking, you really are a CHEMIST, and all your ingredients serve a very specific purpose to make the magic happen. The sugar in cakes not only act as a sweetener, but adds moistness, and helps with browning. Without the right ratios of flour, fat, egg, and sugar, you can end up with a mess. My advice to anyone looking to make a low-sugar or sugar-free cake, prioritize and set reasonable expectations. At first I thought my number one priority was making a sugar-free cake, but after some of these failed attempts that were just not sweet enough, I realized that what I really wanted was an awesome CAKE for my daughter, and a low-sugar version of that cake was a secondary goal. Once I accepted that, using dates became the perfect solution. I also used a lower-sugar cream cheese frosting that went perfectly with the chocolate cake. Have you tried making a sugar-free cake for your family? Share your experience in the comments!